On Tuesday, August 14, Wisconsinites head to the polls for the 2018 primary elections. The elections pit Republicans against Republicans and Democrats against Democrats. Candidates hope to come out of the election as their party’s nominee in the November general election. For the winners, the primary results signify a passing grade on a difficult test. For the losers: the end of the road. This year’s primary features elections for a number of high profile political offices. Candidates seeking their party’s nomination for U.S. Senate, U.S. House of Representatives, Governor, Lieutenant Governor, State Attorney General, State Treasurer, Secretary of State, State Senate Seats, and State Assembly seats are up for election on August 14. While every primary is important, the U.S. Senate and Gubernatorial primaries are the two high profile races on the ballot. State Senator Leah Vukmir and former combat Marine Kevin Nicholson square off in the Republican primary for U.S. Senate. The winner faces Democratic incumbent U.S. Senator Tammy Baldwin in November. State Senator Leah Vukmir first won election for political office in 2002. She served in the State Assembly from 2003 to 2010. In November 2010, she achieved election to the State Senate, representing areas of the western Milwaukee suburbs. During her candidacy for U.S. Senate, Vukmir routinely touts her credentials as a consistent, proven conservative, and she often speaks of her friendship with Governor Scott Walker. She also highlights her history of standing up to unions, advocating for the 2nd Amendment, and strong pro-life stance. Kevin Nicholson, from Delafield, promotes himself as a “political outsider.” While Nicholson has never previously won an election for government office, he has had experience in the political arena. As a student at the University of Minnesota, Nicholson actively participated in the College Democrats of Minnesota and was elected chairman. He eventually became the national president of the College Democrats of America and moved to Washington, DC to serve his term at the organization’s headquarters. As president of the organization, Nicholson delivered a speech at the 2000 Democratic National Convention. Following graduation, Nicholson joined the Marines. It is during his military experience, Nicholson has stated, he became a Republican. According to his campaign website, Nicholson is particularly concerned with the nation’s growing debt and its implications on national security. Much of his campaign to this point has focused on fiscal conservatism and spending concerns. However, Nicholson also touts his social conservatism as a devout pro-life candidate and a 2nd Amendment supporter. While Vukmir and Nicholson largely agree policy, they have tried to distinguish themselves based on experience and background. Vukmir believes her 16 year record as a proven conservative legislator is her strength, which she compares against Nicholson’s lack of proven record. In contrast, Nicholson considers Vukmir just another establishment career politician. He believes his status as an outsider serves him well. Recent polling shows conflicting forecasts for their primary showdown. The most recent Marquette University Law School poll indicated Vukmir had a 2 point lead. However, an NBC/Marist poll from July 26 gives Nicholson a 3 point lead. At this point, the two candidates appear to be in a dead heat. Whoever wins on August 14 likely faces a steep uphill battle against Senator Baldwin. The same NBC/Marist poll shows Baldwin holds a 15 point lead over Nicholson and a 17 point lead over Vukmir in a hypothetical head-to-head race. Republican Governor Scott Walker seeks his third term in 2018. Walker does have a primary challenger. However, as nearly all political spectators would likely say, he has nothing to worry about. In contrast, there is a crowded field of candidates in the Democratic gubernatorial primary. Based on polling, the frontrunner appears to be State Superintendent of Public Schools Tony Evers. Evers first won statewide election as State Superintendent in 2009 and has won reelection twice. He previously served as a high school principal in Tomah and school district superintendent in both Oakfield and Verona. Given his background, Evers has centered his campaign on restoring funding to public education. He’s also spoken extensively about transportation and infrastructure. He says he’s committed to working in a bipartisan fashion to solve the transportation funding crisis. In the most recent Marquette University Law School poll, Evers received 31% support. The next closest candidates both polled at 6%: Fire Fighter Union President Mahlon Mitchell and State Senator Kathleen Vinehout. Adding fuel to Evers’ momentum fire, the NBC/Marist poll indicated Evers leads Walker by 13 points in a head-to-head matchup. While Evers appears to be the predetermined nominee, there are no certainties. Additionally, there may be some insider information that shows the race may be closer than polls have shown. 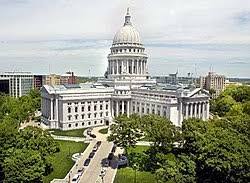 The Republican Party of Wisconsin recently began running ads against Evers, Mitchell, former State Representative Kelda Roys, and former Chair of the Democratic Party of Wisconsin Matt Flynn. While these races attract the majority of the primary media coverage, there are other state office primaries on ballots throughout the state. In 2018, 17 of the 33 State Senate seats and all 99 State Assembly seats are up for election.